Digital marketing is the fastest growing phenomenon within the vast world of marketing, with studies showing digital marketing expenditure has increased by approximately 11% every year since 2000. The best thing about digital marketing is how adaptive it is to new trends within markets. With Google’s algorithm and keywords that receive traffic being regularly tweaked and adjusted, digital marketers must be flexible in their work to make sure they align with industry changes. 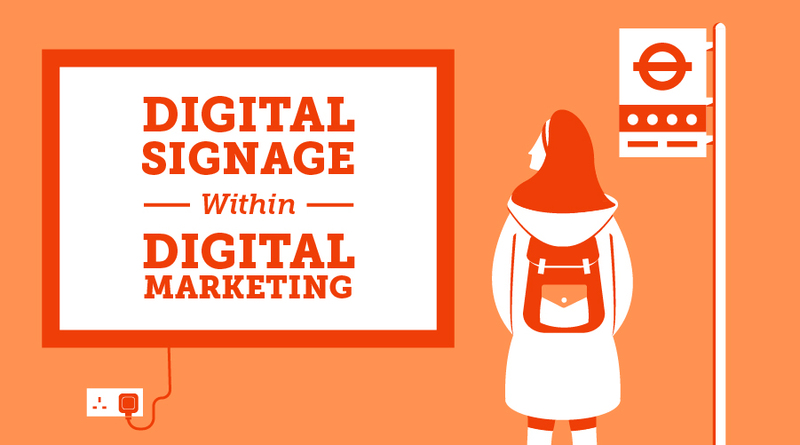 A budding tool within the digital marketing industry is the usage of digital signage. Digital signage, referring to the screens that display content to viewers, is an effective platform on which to build your company’s brand. Building your company brand is not only pivotal in separating yourself from competitors, your brand also represents the sum of people’s perception of your customer service, reputation, logo, and advertising. We are surrounded by adverts every day on our television, listening to the radio, and even being plastered on the side of buses, they seem to follow us wherever we go. As such, the human brain has become a master at filtering out adverts. To counter this, advertisers need to find alternative means to promote their services. Enter digital signage. Digital signage can be a captivating platform that grabs the attention of passers-by, especially in locations with high dwell time and footfall. With the human brain being drawn to motion, static signage and posters do not cut it as a platform to market your products. Building a brand is all about building the perception of your brand for employees and customers alike. Nothing will be more detracting than out of date ripped posters barely hanging on to the wall in your office or shop. To encourage individuals to buy into your brand, you need to optimise your company with the most advanced digital-out-of-home technology. With the technology in the digital signage industry constantly evolving – wayfinding, touch-screen kiosks, video walls – there is no better time than now to invest in innovative digital signage technology. Keeping marketing collateral up to date is both expensive and time-consuming. Using a cloud-based digital signage solution means that you can quickly access your platform and upload media, change text, and promote new deals. Furthermore, as you can schedule content weeks, months, and years in advance, there is no need to have to frequently adjust your signage platform. The result: more time to focus on running the other aspects of your business. No matter how large or small the organisation, every marketing strategy centres around the opportunity to generate revenue. Digital signage screens – ideally positioned in a location that receives relatively long dwell time and high footfall – are an attractive prospect for businesses to advertise on. Potential earnings on signage screens really have no limits – whether you are a veterinary practice, estate agent, or hotel, the opportunity to sell sponsorship space to other businesses is endless and uncapped. In conclusion, developing your identity can be effectively supplemented through a strong digital signage marketing strategy. Configuring this to align with your overall digital marketing strategy can help your company blossom and your brand strengthen. Guest post written by Dominic Hinchliffe, a Marketing Intern at TrouDigital specialising in digital signage marketing strategy.